The most spectacular form of ESD is the spark, which occurs when a strong electric field creates an ionized conductive channel in air. This can cause minor discomfort to people, severe damage to electronic equipment, and fires and explosions if the air contains combustible gases or particles. However, many ESD events occur without a visible or audible spark. A person carrying a relatively small electric charge may not feel a discharge that is sufficient to damage sensitive electronic components. Some devices may be damaged by discharges as small as 12 volts. These invisible forms of ESD can cause device outright failures, or less obvious forms of degradation that may affect the long term reliability and performance of electronic devices. The degradation in some devices may not become evident until well into the service life of some devices. Lightning over Rymań town. Northern Poland. A spark is triggered when the electric field strength exceeds approximately 30 kV/cm (the dielectric field strength of air). This may cause a very rapid increase in the number of free electrons and ions in the air, temporarily causing the air to abruptly become an electrical conductor in a process called dielectric breakdown. 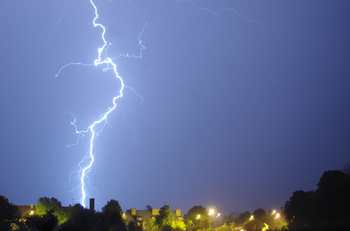 Perhaps the best known example of a natural spark is a lightning strike. In this case the potential difference between a cloud and ground, or between two clouds, is typically hundreds of millions of volts. The resulting current that flows through the ionized air causes an explosive release of energy. On a much smaller scale, sparks can form in air during electrostatic discharges from charged objects that are charged to as little as 380 volts (Paschen's law). Earth's atmosphere consists of 21% oxygen (O2) and 78% nitrogen (N2). During an electrostatic discharge, the intervening atmosphere become electrically overstressed. The diatomic oxygen molecules are split, and then recombine to form ozone (O3), which is unstable, or react with metals and organic matter. If the electrical stress is high enough, nitrogen oxides (NOx) can form. Both products are toxic to animals, and nitrogen oxides are essential for nitrogen fixation. Ozone attacks all organic matter by ozonolysis and is used in water purification. Sparks can cause serious explosions because of the high temperatures reached in a spark, methane and coal dust explosions having been suspected as being caused by electrostatic discharges. The Hindenburg disaster has been attributed to spark discharge igniting flamible panels which led to the ignition of hydrogen gas held in or leaking from the airship at the time. The ship had just passed through a thunderstorm and so probably picked up a large charge. Discharge occurred when mooring ropes were dropped as it came in to land in New Jersey in 1937. The Hindenburg, moments after catching fire.